The 2494-22 M12 Cordless 2-Tool Combo Kit includes the M12 3/8 in. Drill/Driver and the M12 1/4 in. Hex Impact Driver. The innovative M12 cordless Li-Ion system is designed to deliver the power and torque required for professional applications, in a size that reaches the tightest and toughest places. 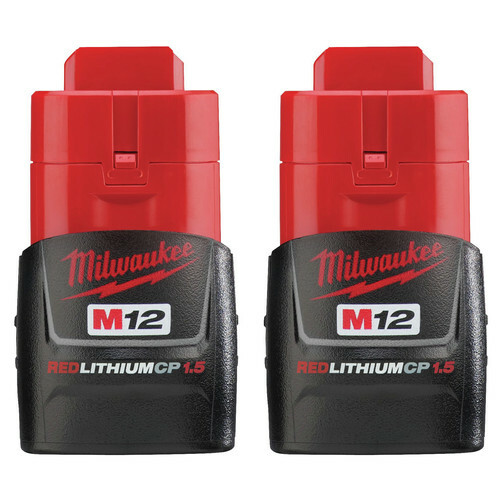 Powered by REDLITHIUM , the M12 cordless Li-Ion system offers unmatched power, speed, and tool belt portability. The tools were as advertised and arrived in good condition and a timely manner..
great for most anything under about 3 in. screws. either one will drive the big ones. great for around home and to keep behimd the seat or in the trunk for quick fixes anywhere. I have used this combination kit, it's great! Small package with good power for it's size. I have given 2 sets away as gifts to my relatives. I've been using Milwaukee tools for a long time. I especially like the M12 lineup because they are so lightweight and dependable. If I have a big project then I just reach for one of my M18 tools and they get the job done too. I like many kind of Millwake tools.I used that at my home project and on my work place too. I used the driver to remove and install nearly all the small, low torque bolts on my Ford 5.4 - 3 valve timing chain and phaser install. More power, smaller and lighter than my green 18 volt drivers! 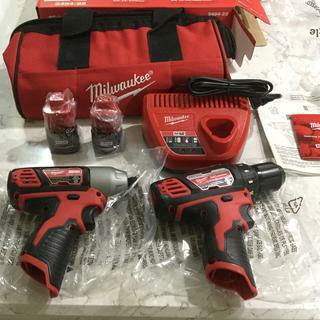 I, have been buying Milwaukee cordless & corded power tools for years and they have not failed me. I use my tool and I take care of them and I will have been getting many years of use out of them. Great buy for a small bathroom replacement project. The combo kit was a gift for his 34th birthday. He is gutted his bathroom and has to replace everything. We put in a new tub, backerboard, new drywall, etc. The Milwaukee impact driver was much better than his old drill he used on his last project. Is there enough power with the 12v? BEST ANSWER: Very satisfied. This will put 3" screws in a 4x4 with ease. i have put in as many as 50 in one job and still had battery left. If you need lots more power without going to 18 volts, the 12 volt fuel series is fantastic but is more money. The drill driver is good up to about a 7/8 paddle bit. Anything bigger and there is not enough power. The impact driver is great. No problems. Drive 2 to 3 inch screws no problem. It is best to upgrade to the updated batteries though. Otherwize the batteries that come with the drill loss charge much faster. I have six sets of these drills and use them for my business. We beat them up pretty good and they keep on turning screws. If your looking for more power. Just jump up to the 18v. That drill has twisted my hands a few times. Hope this helps. Well, it is not as powerful as an 18v (obviously), but it will do 95% of what I need. I work mostly in wood, and the drill and impact driver work great, much lighter than the 18v nicad tools that I have. They will work with lighter metal, and I have used the impact to put up corrugated metal sheets into wood with absolutely no problem. I highly recommend this set. BEST ANSWER: No they are not. They are great tools for the price however. I have both these and the Fuel set. This set works for most of my needs without any problems. So with the free battery it will have three batteries? How long does it usually take to receive? Can you send me a 240v charger to 18v ?12v 3pin uk instead of 120v ? Can I get two impact instead of 1 of each?